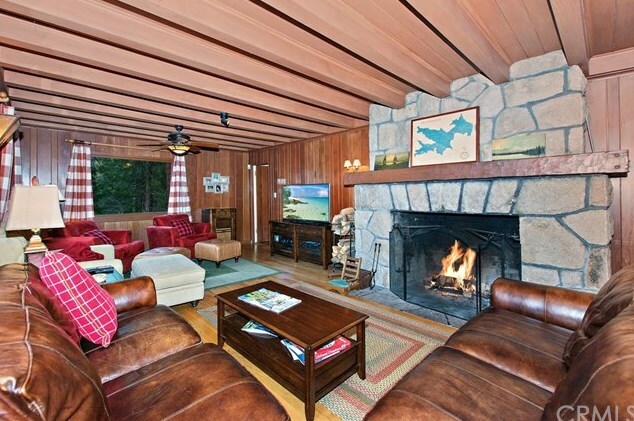 Memories to be made in this vintage Lake Arrowhead home. Warm & Woodsey retreat, situated on 3 lots, just above Lake Arrowhead Village. Wonderfully updated and maintained featuring 3 bdrms, 2 baths & a bonus room. Master is on the main level w/its own bath & walk in closet. Spacious living area with massive rock fireplace, dining area, updated kitchen with slate counters, oak cabinets, stainless appliances & a quaint breakfast nook surrounded by custom stained glass. Upstairs are 2 more large bedrooms & 3/4 bath. Peeks of the lake & beautiful tree views throughout. Lowest level has laundry/utility room & bonus room for extra guests or game room. Amazing outdoor patio area with Split face granite fireplace & built in BBQ. Nicely landscaped w/full irrigation. 2008 Regal ski boat available for extra $. You must see this home to appreciate all of the fine details and charm that it has to offer. You will not be disappointed. 344 Castle Gate Road, Lake Arrowhead, CA 92352 (MLS# EV18025579) is a Single Family property that was sold at $550,000 on April 19, 2019. Want to learn more about 344 Castle Gate Road? Do you have questions about finding other Single Family real estate for sale in Lake Arrowhead? You can browse all Lake Arrowhead real estate or contact a Coldwell Banker agent to request more information. Based on information from California Regional Multiple Listing Service, Inc. as of 4/20/2019 . This information is for your personal, non-commercial use and may not be used for any purpose other than to identify prospective properties you may be interested in purchasing. Display of MLS data is usually deemed reliable but is NOT guaranteed accurate by the MLS. Buyers are responsible for verifying the accuracy of all information and should investigate the data themselves or retain appropriate professionals. Information from sources other than the Listing Agent may have been included in the MLS data. Unless otherwise specified in writing, Broker/Agent has not and will not verify any information obtained from other sources. The Broker/Agent providing the information contained herein may or may not have been the Listing and/or Selling Agent. The information provided is for consumers' personal, non-commercial use and may not be used for any purpose other than to identify prospective properties consumers may be interested in purchasing. All properties are subject to prior sale or withdrawal. All information provided is deemed reliable but is not guaranteed accurate, and should be independently verified.